Bing often lives in the shadow of its competitors. But today it’s stepping forward with a cartoonish yellow foot. 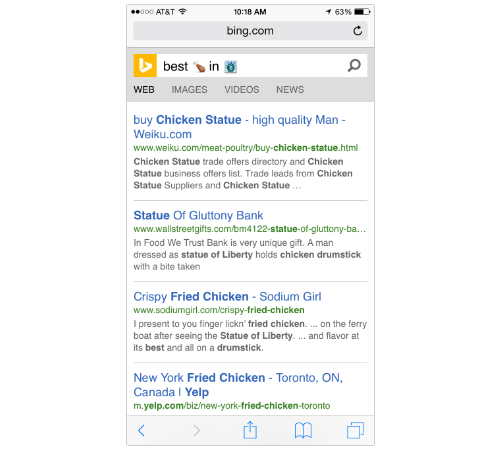 Microsoft announced Tuesday morning that you can now search Bing with emoji, those adorable little pictographs most commonly used in text messaging. This means the next time you’re looking for a good cup of coffee nearby, you could simply enter the corresponding coffee symbol into your browser’s search bar, and Bing will deliver results for cafes. 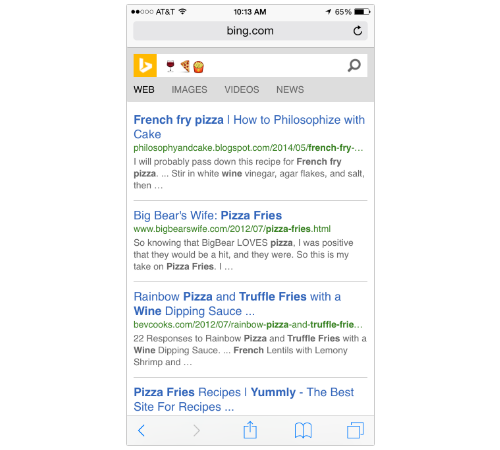 How will Bing decipher what you mean when you (perhaps drunkenly) punch a wine glass, a piece of pizza, and some french fries into your search bar? According to the company’s blog post, it’ll register the “semantic meaning” of whatever symbols you choose and go from there; in other words, it will translate from emoji to English and then search. You can also use this tool to search for just a single emoji (perhaps to decipher, once and for all, what exactly that emoji stands for). 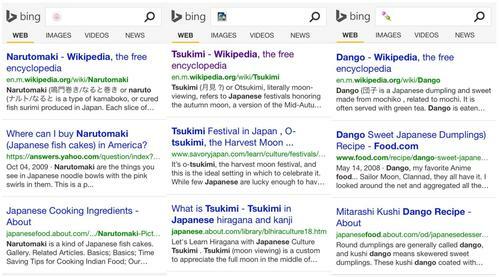 The function works on all of Bing’s English search engines.